We've all seen those gigantic puffs of white meringue prettying-up the windows of trendy bakeries. They've often had a scattering of cocoa powder, or a swirl of fruit puree if you're lucky - some sort of flavouring if you're not - added to thrill. All too often they prove to be mere eye-candy; full of promise but lacking any substance. I know it's only egg whites and sugar so lightness is a given, but meringues need to be tasty or what's the point? My meringue is the antidote to the sweet, strangely powdery confections which are so often the reality of this window dressing. For me a meringue should be a crisp shell with a slightly chewy centre where the sugar has gently caramelised. The colour should be somewhere between pale coffee and caramel, depending on the sugar used. I made the one in the photograph above with a lovely Costa Rican cane sugar bought from Monmouth Coffee. It delivers a somewhat darker meringue and a lovely caramel flavour, but Billingtons also do a good range of unrefined sugars. 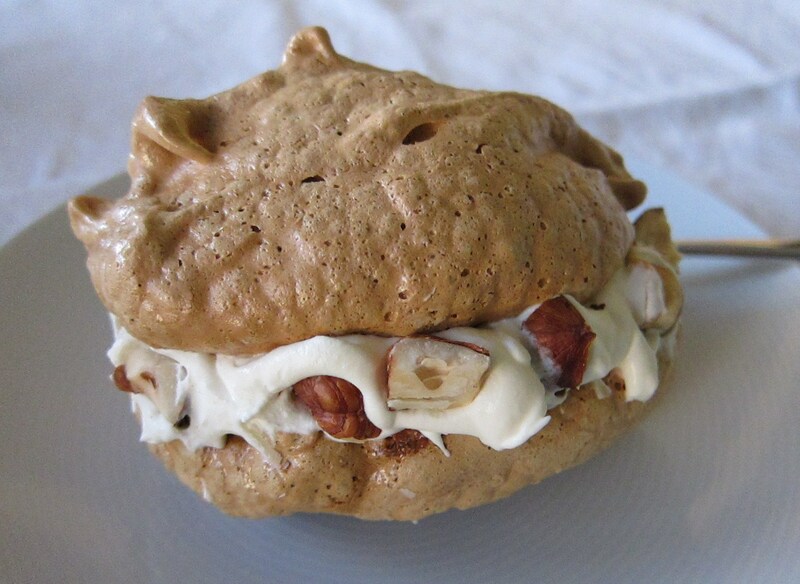 Toasted chopped hazelnuts can be added to the raw meringue mix with the last of the sugar, or can be sandwiched with the cream just before serving. Some cooks add a pinch of salt to the recipe to improve the flavour. If you do, add it towards the end of beating as it can decrease the stability of the egg whites and weaken the protein network that forms the structure of the meringue. Though I wouldn't subject my lovely Costa Rican sugar to this, you could aso warm the sugar on a baking tray in an oven set at 140C for 10 minutes. I'm told this results in a firmer meringue, though that's not something I'm looking for. Another school of thought recommends warming the egg whites and all the sugar over a pan of simmering water until the sugar disolves, then beating the mixture for 15 minutes in an electric mixer for an airier result. Both of these methods add to the workload for, to my mind, no discernible improvement in taste. If, like me, you often have egg whites going spare, remember they freeze well. Pop them in a container and top it up each time you're left with one or two. Just remember to use them within a couple of months. If you keep the containers to 2's or 4's then you'll have useable amounts for making meringues, friands, amaretti biscuits... or an egg-white omelette if you absolutely must! Brush a baking sheet with a little oil and line it with parchment paper. Pre-heat the oven to 120C (Fan oven 100C). Whip the egg whites to soft peaks. Gradually add half the sugar and mix to stiff peaks. Using a metal spoon, fold in the rest of the sugar (and, if using, 2 tablespoons of toasted chopped hazelnuts or whatever you prefer). Place rounded tablespoons of mixture onto the lined sheet and place in the oven for about 1hr 45 mins (a little less for smaller meringues) or until they are crisp to the touch. 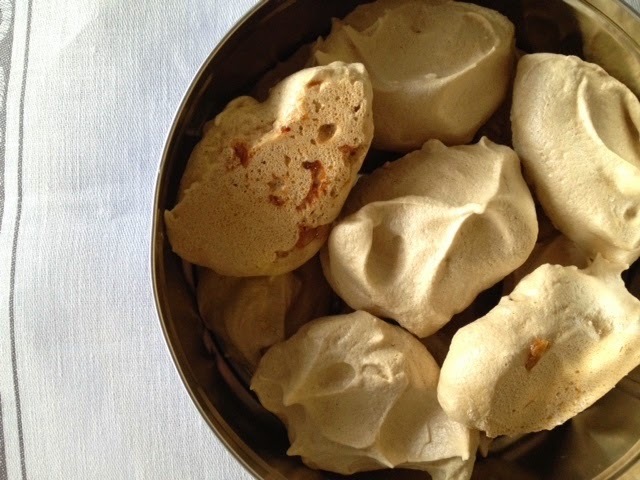 Turn off the oven and leave the meringues in to cool down. Serve with cream, whipped just until it holds, and those toasted hazelnuts if not already added to the meringue. The meringues should keep well for about 10 days stored in a tin. You can also use them to make a parfait - crush them, add to fruit and whipped cream, freeze for a couple of hours and serve in slices.